﻿ Guys, this post (and the video) may be a bit controversial, but since I’m trying to cover all things related to men’s lifestyle, this topic is definitely relevant. Whether or not you’re personally for or against procedures like Botox, it’s hard to deny or ignore the popularity of Botox injections. 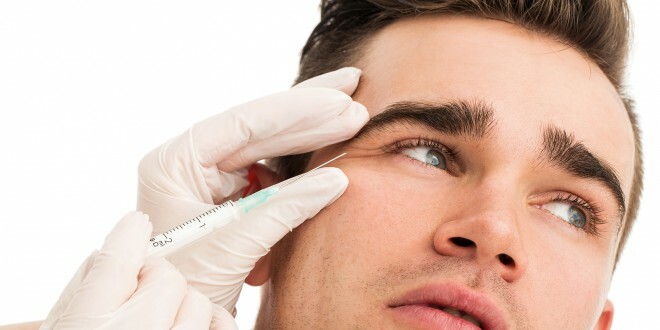 Women (and some men) have been getting Botox treatments for years and while the treatments are easy and successful, there still seems to be a stigma associated with men (especially) having Botox injections. In this video, you can ride along with me as I get Botox injections to see what it’s like, all up close and personal like. Let me go on record and say I’m not a regular Botox recipient. I’ve had Botox only once before and it was about 3 years ago. At this point, I’m neither for nor against having Botox treatments, but if you feel like it’s something you’d like to explore for yourself to make yourself feel better, then I’m all for it. However, with that said, I’m not recommending Botox and I’m not saying that everyone needs to run out and get it done. Obviously, this is not for everybody and this post is only meant as an informative, personal account of my experience. I’m not even sure if I’ll ever have it done again. I’m still processing. From the web.. What is Botox? Botox is used medically to treat certain muscular conditions, and cosmetically to remove wrinkles by temporarily paralyzing muscles. It is made from a neurotoxin called botulinum toxin that is produced by the bacterium Clostridium botulinum. Botox is the most popular non-surgical cosmetic treatment, with more than 6 million Botox treatments administered each year. Botulinum toxin is used to reduce fine lines and wrinkles by paralyzing the underlying muscles. People also use Botox to treat excessive sweating, migraines, muscular disorders, and some bladder and bowel disorders. While Botox injections are generally safe when administered by a licensed professional, only about 1% of people report mild side effects. How does it reduce wrinkles? After the injection moves from the dermis and into the desired muscle, the nerves there are blocked—rather, their synapses are blocked—by the Botox. So even though your brain my fire and signal for your body to move a particular muscle, Botox effectively blocks that firing and keeps the muscle from moving. The injected muscles can no longer contract, which causes the wrinkles to relax and soften, and also helps prevent new ones from forming. Once it’s in, it’s in—for about four months, until it dissipates, and treatment is needed again. Once the protein stops functioning at the neuromuscular junction, it is broken down into its harmless components (amino acids) and either recycled for use in other proteins or excreted by the kidneys. The bigger the muscle, the quicker you’ll see motion return. Likewise, the smaller the muscle, the longer the effect of Botox lasts. It doesn’t have a tolerance effect, either—your body never gets used to Botox. Guys, let me be perfectly clear.. I just wanted to take this opportunity to ‘take one for the team’ (so to speak) and show you guys what it’s like in the office actually having a treatment done. The bottom line is that it’s quick, painless, easy and effective. If you have questions, please feel free to reach out and post a comment below. I’m not an expert, but I’ll try to answer what I can. I welcome you to watch my video (and please subscribe to my YouTube channel) and do your own research if you’d like to possibly entertain the idea of having your own procedure done. OMG! So informative John! I’m hoping to get this done next year to prevent my elevens, or what I like to call my “resting b%tch face lines” from forming more. Excited to see how long this lasts for you! Thanks Alex! I’ll keep you posted!